His Beatitude Metropolitan Tikhon, the Primate of the Orthodox Church in America, arrived in Russia to celebrate the 70th birthday of Patriarch Kirill and All Russia. Anyway, he found some time to meet with an Interfax-Religion correspondent and share his opinion about the recent presidential campaign in the United States, ongoing crisis in Ukraine and tell some interesting facts about Orthodoxy in America. - You came to Moscow to congratulate Patriarch Kirill on his 70th birthday. How good do you know the patriarch? What would you like to wish him? - I would like to express my deep thanks to His Holiness for the invitation to come here. I have known the patriarch since 2009, when he was elected patriarch. I was present here at his enthronement. He has been to America on several occasions as the head of the Department for External Church Relations, but I don't believe I personally met him, I was in a monastery at that time. 2009 was the first time I personally made the acquaintance. I think I'll ask that God will continue give him strength especially we've seen at the gathering this week where His Holiness was able to bring together representatives of all the Orthodox Autocephalous Churches, many primates were here and are still here and I think it is a testimony to his great ability as an Orthodox Christian leader to exemplify this sense of unity. I would like to wish him many years of health, strength to continue that work of unity, continue to be an inspiring spiritual leader for the Russian Orthodox faithful. - What impressions do you have from Donald Trump's campaign? What do you expect from the new president? - I think it is certainly known to almost everyone, who watches the news, that this year the campaign for the presidential elections was very difficult, perhaps, confusing to many people even in the United States, painful, but in the end the citizens of the United Stated followed the process as established and elected a new president, there continues to be some conflicts in the United States, in a sense more or less normal for the process, there are always difficulties of the transition from one president to another. My hope and I think the hope of the faithful and the bishops and priests of the Orthodox Church in America is that we are cautiously optimistic about the good work the new president will do, we pray for him, as we pray always in the divine liturgy for the civil authorities. We hope he will preserve the stability within the United States and hopefully will promote good relations with other countries of the world, in particularly with Russia, as there has always been good relations between the United States and Russia and sometimes there are tensions, and we hope that our Lord Jesus Christ will enlighten the new president to do the right things and continue these good relations. - The new chief of staff of the president elect, Reince Priebus is an Orthodox Christian and a developed Orthodox Christian, but I am not sure that he is a star. Among the celebrities, I can name the film star Jonathan Jackson, he is in Los Angeles. Rock singer Chris Cornell. Stars or not, when they come to the church, they are all the same. I think that in the United States the personalities try not to show their faith, they are very neutral, when it comes to their faith. That's unfortunate may be, but they are not public about their faith, it is really often in America among stars, celebrities, business people. You know, Orthodoxy in the United States attracts very many coverts from other backgrounds. I myself is a convert to the Orthodox faith. - And how did it happen? - Well, I was raised in the Anglican Church, in the Episcopal Church in the United States and I personally fell away from the Church, even from belief in God when I was very young, and then slowly I returned to the Church. My father is a scientist, so I was raised with an idea that you can either be intelligent or be religious. So I made a choice when I was very young and inexperienced: I'll be an intelligent, not religious, but slowly, meeting people I realized that it is possible to be intelligent and faithful person. I started studying more carefully the life of the Church and eventually I discovered mostly through people and books about the Orthodox faith and began the process of becoming Orthodox. - How old were you when you joined the Orthodox Church? - And are your parents believers too? - My father is not a believer. My mother is ordained as episcopal priest, she is serving in her own way. - During the jubilee celebrations in Moscow it was said a lot about Ukraine which goes through the violent crisis today - war in Donbass, economic crisis, social and political disagreement. How a believer should act in such a situation? - It is always a source of sorrow when we see the situation that is happening in Ukraine and it is even more painful when the faithful are in the middle of a difficult political situation and civil war. 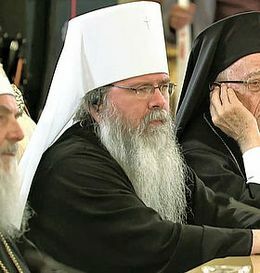 I am from the Church of North America and it is difficult for me to know exactly how to help the faithful here, but certainly His Holiness Patriarch Kirill, Metropolitan Onufry of Kiev and All Ukraine, bishops and clergy are trying to offer the pastoral guidance and they do that very well. It is always good to trust in guidance of God and through the Church and prayer, prayers are really important, modern people do not think there is much value in prayer, they want some kind of concrete political action, but I think that is our action in the Church for the faithful to focus their life on prayer, to strengthen each other, not to feel alone. When in difficult situation, people often feel isolated and I think the Church through prayer can help to build that sense of unity among the faithful and encourage them. I would offer my personal prayers and the prayers of the Church of America to the faithful to encourage them to trust in God and maintain that sense of hope that Our Lord in the Gospel offers. - Social conflict in Ukraine has a religious context as well. Ukrainian Greek Catholics speak from positions of radical nationalism and urge to continue war in Donbass. The Ukrainian Orthodox Church headed by Metropolitan Onufry tries to remain politically neutral, but it exists under pressure. Do you think that the Church can participate in political activities? - The Churches were founded on Jesus Christ Who came to establish peace. He also said there would be difficulties, reality of wars and civil wars is there, but the Church as a body cannot ever call to violent actions or choose a side and encourage the civil war, the Church recognizes the reality of conflict, we have chaplains that serve in the military services, but their purpose is not to make any political statement or encourage that, but to provide pastoral care to those who are serving in the military forces, they are human beings and many of them are Orthodox Christians. As an institution the Church can never ever call for a violent conflict or even take a side in a political situation. The faithful and the Church is here to be in the world, but not of the world and we try to preserve the reality of the Kingdom of God in whatever political situation we find ourselves. It means the Church cannot really say that we are on this side or on that side, but to remind people about important eternal values of the Church.